This family is from my Maternity & Family Greenhouse session (and one of my all time favorite families). I am finally getting around to blogging about their newborn - but I’ll have to share this newborn’s 6 month pictures (and soon to come one year pictures). To say I’m a little behind is an understatement. Anyway, I have talked about this family keeps me laughing and it was no surprise that their lifestyle newborn session would be any different. Their first baby, Big Red, was photographed in my in-home studio and was so chunky and perfect. This go around, since I don’t have an in home studio anymore, I came to their house.. only to find out that they were getting ready to move to Texas. :( So, in a way, this was their last hoorah in this house and a memory that they can always hold on to. I love that this family just sat back and let me capture their version of real life. <3 Love y’all, Edge fam! See you soon for that one year session! Ha! Lifestyle newborn sessions can be combined with wrapped poses so you get the best of both worlds. The family interaction (fur babies included), but also some sweet images of just baby alone. I like the variety that this provides to families. I have always been a strong proponent of lifestyle in home sessions for newborn photography because it does capture your life in that moment. That house. Those rooms. That crib (that they probably have never slept in.. yet). I just feel like they capture so much emotion down the road and you are instantly taken back to this time in your life where you are sleep deprived and just trying to get the hang of this whole parenting thing. 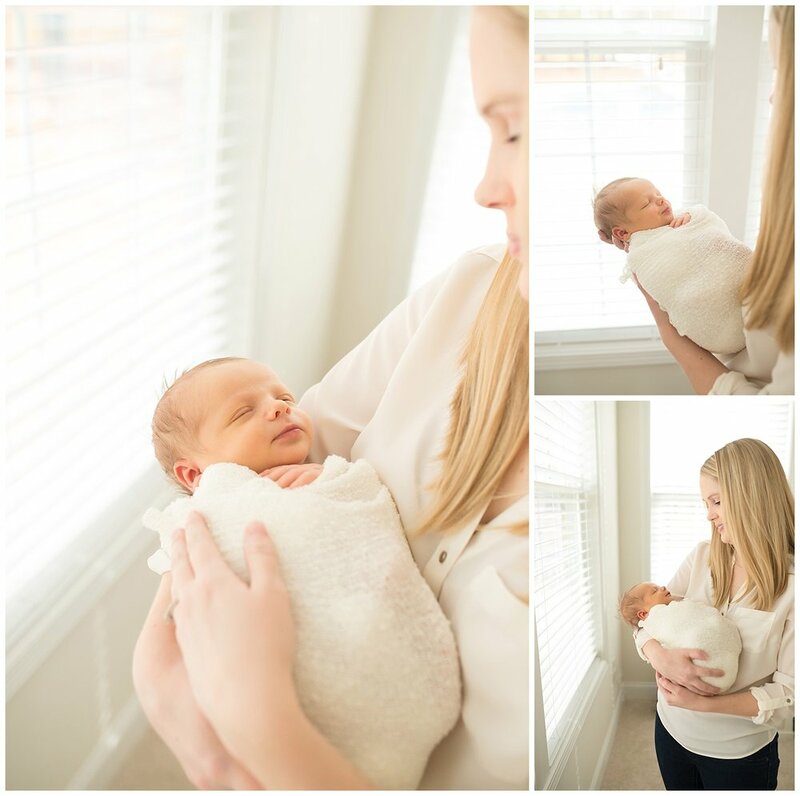 This is one example of a lifestyle newborn session that is combined with a wrapped portion. Congrats, C family on your new bundle of joy! One of the best parts of my job is getting to watch my families grow from behind my camera lens. This is a repeat client who happens to also be one of my first lifestyle newborn sessions! This family has tons of natural light in their home which works wonderfully for lifestyle newborn sessions. We used elements of their home, like that blue chair above, to pose baby on. It will be cute to see down the road how big he is when he sits on it as a one, two, or three year old and remember how tiny he use to be. I always try to make sure I sit back and let the session just roll the way it is going to roll. I like to get the "in between" shots and and with two other little ones, there was plenty of candid moments to capture. It also allows siblings to be themselves and be free in their own surroundings while I photograph their new brother/sister. I captured a similar shot not too long ago with Lily's newborn session! Thank you again for letting me be a part of your newborn story. The little details of his wrinkly hands; the older kids playing in the background; dad finally getting his hunting buddy after two girls.. I love it all! Congrats, G Fam! Y'all. This session might take the cake for my favorite in-home session thus far in 2018. Here are a couple of reasons why. First, this is a repeat client of mine. I love that I get to document my families growing and meet their new nuggets! Second, can we talk about adorable kids? They have the best eyes and hair! Third, this kiddo slept.the.whole.time. The whole time. It might go down as one of the fastest sessions I've ever done. Fourth, being a mom of boys myself, I do love some brotherly love! And lastly, this is the perfect example of how to have a lifestyle newborn session with an older toddler. Little man did NOT want to have anything to do with pictures. My attitude towards that is, cool. Let's roll with it. There is no point in forcing a young child to sit and look pretty. That is not what they are made to do! So, in my sessions, I try to calm the parents nerves and say, "they'll get in some.. just wait.." What this meant for this family was him playing in his play room and bringing them all sorts of fun cars, toys, and requesting snacks. But, it was the inquisitive nature of this toddler that kept me snapping pics. He lovedddd looking at his little brother. By the end of the session, without prompting I might add, I had little brother in a crate and big bro just walks over and starts pointing at his toes. He was saying how little his toes were and was trying to count them. Then, he sat, and compared his toes to little brothers. It was a.dor.able! And this is why I am a self-proclaimed "over shooter." If I had just stopped and packed up my camera, I would have missed all of this! Love it!! I hope you enjoy them as much as I do! Thank you, Andres family, for continuing to allow me to capture these moments of your life!